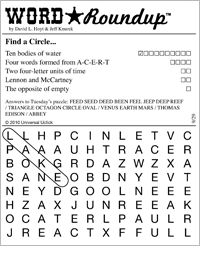 Categories: Puzzles, Word, Top Games, Html5, Print. Word Roundup is an innovative variation on a classic format, combining the challenge of a crossword with the quick-solve satisfaction of a word search. 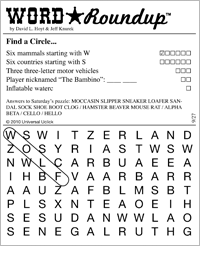 Unlike most word searches, in which the player knows what words to look for, Word Roundup gives crossword-style clues for the hidden words. 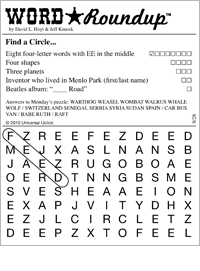 If you think word searches are too easy, or if you're looking for a new wrinkle on an old favorite, give Word Roundup a try! Prolific puzzle creator David L. Hoyt has been in the games business since 1993, when he gave up a successful career in the financial sector to pursue his passion for puzzles. His wildly popular Word Roundup appears in the USA Today newspaper, with several variations played by millions online every day. Hoyt’s other creations include USA Today’s Up & Down Words, Pat Sajak’s Lucky Letters, Jumble Crosswords, TV Jumble, Find ‘Em Poker and more. He has collaborated on dozens of other games, including Jumble Word Vault, Boggle Brainbusters and Tic-a-Tac Poker, and has sold board games to Hasbro and Mattel. His work appears in print, online, on mobile devices, in card games -- even in casino slot machines and scratch-off lottery games. Two of Hoyt’s recent creations are the Just 2 Words app game and the Word Winder board game (also popular in its app format). He currently lives in Chicago with his wife, Claire, and enjoys cycling, running and golf. Hoyt is excited to start each day in his world of puzzles: “I wake up by about 4 a.m. almost every morning because I can’t wait to do what I do,” he said. Jeff Knurek, Jumble cartoonist, is an award-winning toy and game inventor, consumer product developer, graphic artist, illustrator and puzzle creator. In 2008, Jeff became only the third artist to draw the cartoon for the 60-year-old Jumble puzzle, which is seen in over 600 newspapers. Jeff took over the art duties when the great Henri Arnold retired. Jeff’s unique humor and style can be seen in the caricatures and fun pop culture references placed throughout his cartoons. Jeff attended the University of Michigan, mainly to watch Bo Schembechler, but also to attend the university's art school. He earned a B.F.A. in Industrial Design with an Art Education certification. He's a member of the National Cartoonist Society. He's also a swim parent, inhaling chlorine while watching his children swim year-round. When he draws cartoons, his trusty rescue dogs, Gizmo and Fifi, are always by his feet. Jeff’s favorite bands are Wilco and Poi Dog Pondering, whose names are frequently seen on Jumble characters' T-shirts. He resides in Fishers, Indiana with his wife, Kathy, and children Sydney and Cameron.